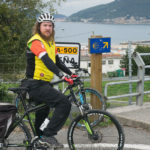 If you take a walking or cycling trip with IrelandWays.com you may find that some of the landscapes look strangely familiar. This is because you may have seen them featured as backdrops in movies and TV series. Over the years the rugged and wild landscape of Ireland has proved to be a perfect location for filming, not just for stories set in Ireland but also for movies and shows recreating a world of fantasy. We take a look at some must-watch movies filmed in Ireland to get you inspired! Without a doubt Game of Thrones has been a TV phenomenon and has become one of the most watched and talked about TV series of all time. One of the things which make the show notable are its epic locations. There are a total of 11 filming location in Northern Ireland and three of them are on the Causeway Coast Way walking trail. Castlerock Beach near Portstewart in County Derry is Dragonstone and Larrybane near Carrick-a-Rede in County Antrim features as The Stormlands. 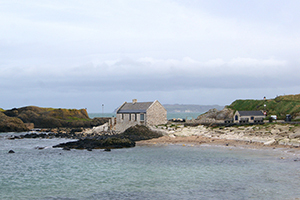 Perhaps the most distinctive of the locations is Ballintoy Harbour in County Antrim, which features in the series as Pyke on the Iron Islands. As major fans of the series we know that the Game of Thrones inspires adventurers from far and wide. The dramatic Atlantic landscapes of UNESCO-listed Skellig Michael island provided the perfect location for last instalment of the Star Wars saga. 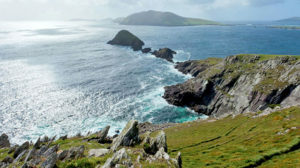 Stormtroopers will be returning to the spectacular Wild Atlantic Way for yet another epic movie: the Dingle Peninsula, Donegal and West Cork will be some of the backdrops feeling the force of Hollywood’s best loved remote galaxy. You can take a boat and visit Skellig Island if you are hiking the Kerry Way. 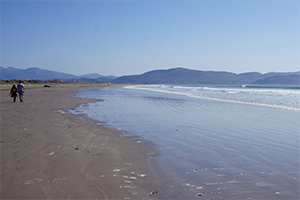 This won’t be the first brush with fame for the Dingle Peninsula, as gorgeous Inch Beach was one of the filming locations for romantic drama Ryan’s Daughter. The Field is a play written by John B. Keane and tells the story of the confrontation between a land-owner and the hardened farmer tenant who has been farming a piece of land for years. 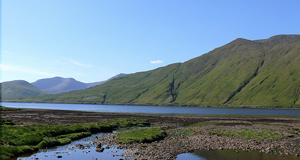 The film adaptation of the play was filmed in the vicinity of Leenaun in County Galway, on the edge of Killary Fjord. All of the outdoor scenes in the film were filmed in the area, including the roaring Aashleigh Falls which are the backdrop to one of the most powerful scenes of the film. Leenaun and the surrounding area are on the route of our Wild Atlantic Way cycling tours. Man of Aran is a fictional documentary which was shot on the Aran Islands in 1934. The film follows the hard lives of the people of the time who lived on the islands and fished in the wild Atlantic. While there are some who say that it is not necessarily accurate in its portrayal of the people and their lives, it is nonetheless one of the first films of this type and it is visually stunning. The landscape of the islands hasn’t changed much since the film was made and our walking tour on the Aran Islands offers the perfect opportunity to follow in the footsteps of the Man of Aran. In this era of computer-generated imagery it is sometimes easy to forget that the incredible scenery we see in fantasy films is actually real. One of these places is the Cliffs of Moher which features in Harry Potter and the Half-Blood Prince. 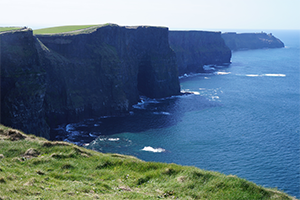 The cliffs which stand at over 200 metres over the Atlantic proved to be the perfect backdrop for Harrys search for horcruxes. You may also remember the location as the ‘Cliffs of Insanity’ in The Princess Bride. 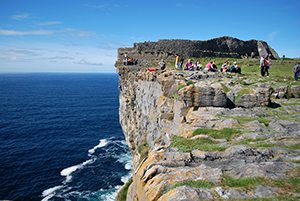 The Burren Way will take you right along the clifftop walk and the fifth section of the Wild Atlantic Way Cycling tour also passes the cliffs. Due to its proximity to international access points and Ardmore Studios, County Wicklow has been a popular filming spot for many years. It is a location director’s dream as it offers rugged mountains, picturesque lakes and streams, wild bogland, open grassland and plenty of coastline. Of the movies and shows which have been filmed here some of the most notable are Excalibur, Braveheart, Michael Collins, Lassie, The Tudors, Reign of Fire, King Arthur and more recently The Vikings hit TV show. 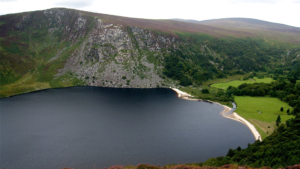 The show is still being filmed in parts of Wicklow and if you’re lucky you may spot the longships and village of the Vikings, which sits at the edge of Lough Tay in the valley below the Wicklow Way. What are your favourite movies filmed in Ireland? Let us know!